In this video tutorial I teach how to do a ton of things with WordPress. 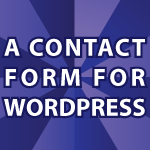 I teach you how to create a contact form for WordPress. This contact form is extremely customizable and includes both Akismet and Captcha spam blocking. It also allows for file uploads. Then I show you how to create an email capture for an e-book system inside of WordPress. It’s easiest to install these plugins from inside of WordPress, but here are the websites that contain more info on these plugins. How about if I want to sell an EBook- how do I create downloadable Ebook only when someone buys it? Your videos are simple and straight forward, yet very useful. Thanks. I need some more information to be able to help. Any errors? What are you seeing? I have make a custom wp multipart registration form, that does it all so well, but fails over every other day. Thats because of a session security feature that WP uses to validate that the form information came from the current site, rather than an untrustworthy external source. Do you know about this, and how to “dynamically” get this value from the actual registration site? I’m sorry, but I’m not sure what you are trying to do. Why not use the registration system built into WordPress which is much more secure? This form doesnt use any wp codex, cause its supposed to do other cP stuff and only post the registration information, that matches the cP information to WP to complete the registration. oh, and… this form doesnt use any wp codex, cause its supposed to do other cP staff and only post the registration information, that matches the cP information to WP to complete the registration. I woke up this morning and thought I need a registration form on my website. I spent all day struggling through tutorials and php to no success, when finally at nine o’clock this evening I thought, “I bet Derek Banas has a solution. He knows everything about WordPress.”. An hour later success. I just wish I had thought to check here 12 hours earlier. Thank you for the nice compliment 🙂 I’m happy that I could help.